KAHULUI — Molokai High School made history in more ways than one during Saturday’s Maui Interscholastic League judo championship at Shine Matsui Athletic Center. 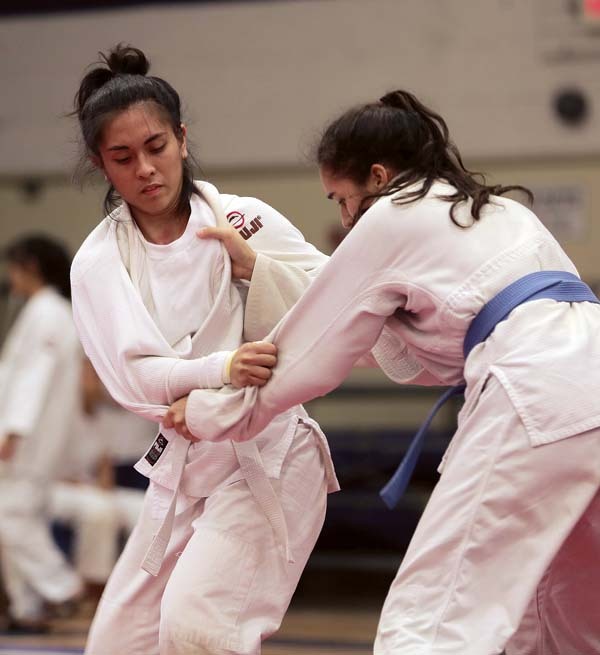 The Farmers girls captured four gold medals on their way to their first-ever judo team title, while Ikua DePonte won his fourth straight title for the boys. “I think this is the beginning of a good thing on Molokai,” Farmers coach Kalei Roberts said. The school of about 350 students was among the larger teams Saturday after sending 12 girls and four boys — a feat as rare as its success. Molokai, which started its team four years ago, only competed in two tournaments during the regular season due to limited travel funding. Kamehameha Maui took second and Baldwin finished third in the girls race. Kawohi Duvauchelle and Kawena Davis captured the 129-pound and 154-pound titles, respectively. Gabrielle Aquino (109) and Malia Keanini (220) won unopposed. DePonte capped off his career with a come-from-behind, overtime victory against Baldwin’s Matthew Kauhola in the boys 161 final. He is the school’s first four-time judo winner. King Kekaulike took home the boys team title, followed by Baldwin and Maui High. Na Alii captured four gold medals from Yancy Rivas (108), Aidan Hanley (121), Makia Lorenzo (145) and Ilima Kaawa Richardson (178). 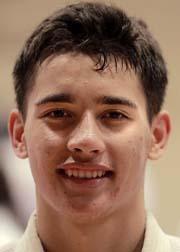 Hanley, a sophomore, won his second straight title with a pin of Maui High’s Jayven Domingo. King Kekaulike coach Claude Moreau said he was proud of his boys despite the team’s small numbers. Other girls champions were the Warriors’ Jillian Ikehara (98), who also won in 2016, Na Alii’s Keireana Higaki (115) and Sarah Fusato (122), and the Bears’ Tasia Matsuda (103), Waipuilani Estrella-Beauchamp (139) and Aliyah Palad (172). Boys winners included Maui High’s Aden Molina, who won his second straight title, and Jayzen Alvarado (220), and Baldwin’s Kolby Inouye (114) and Marc Domingo (132). The state tournament is May 5 at the Stan Sheriff Center in Honolulu. Team–1. Molokai, 2. Kamehameha Maui, 3. Baldwin. 98 pounds–1. Jillian Ikehara, Kamehameha Maui; 2. Teani Kaluhikaua, Kamehameha Maui. 103–1. Tasia Matsuda, Baldwin; 2. Lhea Javierto, Maui High; 3. Hiwa Duvachelle, Molokai. 115–1. Keireana Higaki, King Kekaulike; 2. Katrina Ceria, Maui High; 3. Niya Matutino, Kamehameha Maui; 4. Deja Nakamura, Baldwin; 5. Reese Raguindin, Molokai. 122–1. Sarah Fusato, King Kekaulike; 2. Makani Davis, Molokai; 3. Robyn Valle, Kamehameha Maui; 4. Mallory Go, Molokai; 5. Jacelyn Alcantara, Baldwin. 129–1. Kawohi Duvauchelle, Molokai; 2. Cameryn Kahalewai, Molokai; 3. Kiana Holokai, Kamehameha Maui; 4. Lilia Carden, King Kekaulike; 5. Jennie Lopez, Baldwin. 139–1. Waipuilani Estrella-Beauchamp, Baldwin; 2. Payton Kaalekahi, Molokai; 3. Campbell Kaalekahi, Molokai . 154–1. Kawena Davis, Molokai; 2. Anne-Marie Greig, Kamehameha Maui; 3. Anuhealani Davis-Mandija, Molokai. Team–1. King Kekaulike, 2. Baldwin, 3. Maui High. 114–1. Kolby Inouye, Baldwin; 2. Ezekiel Matutino, Kamehameha Maui. 121–1. Aidan Hanley, King Kekaulike; 2. Jayven Domingo, Maui High; 3. Kamalu Kaawa Richardson, Molokai. 132–1. Marc Domingo, Baldwin; 2. Kamahao Kang, Kamehameha Maui; 3. Joseph Heintz, King Kekaulike; 4. John Fernandez, King Kekaulike. 145–1. Makia Lorenzo, King Kekaulike; 2. Makalii Sequeira, Baldwin; 3. Jamie Celis, Baldwin; 4. Ronel Yadao, Maui High. 161–1. Ikua DePonte, Molokai; 2. Matthew Kauhola, Baldwin; 3. Connor Fernandez, Haleakala Waldorf; 4. Lilia Carden, King Kekaulike; 5. Dillon Ikeda, King Kekaulike; 6. Christian Hubbard, Molokai. 178–1. Ilima Kaawa Richardson, King Kekaulike; 2. Brycen Hanada, Kamehameha Maui; 3. Louis Cambra IV, Maui High. 198–1. Aden Molina, Maui High; 2. Akhil Fernando-Bell, King Kekaulike. 220–1. Jayzen Alvarado, Maui High.